Wanna Help Us Hide Marty? It’s been very exciting to see people finding the prints I’ve hidden as part of our Find Marty Art Drop. It works like this: I hide a limited edition signed print somewhere in the world and post a clue on Facebook, Instagram, and Twitter. A tiny penguin (aka “Marty”) is included with the print, along with a note containing instructions and a little bit about Penguins Can’t Fly. The winner is the first to find it. If he or she takes a picture with it and tags us online, we send them a free autographed book. 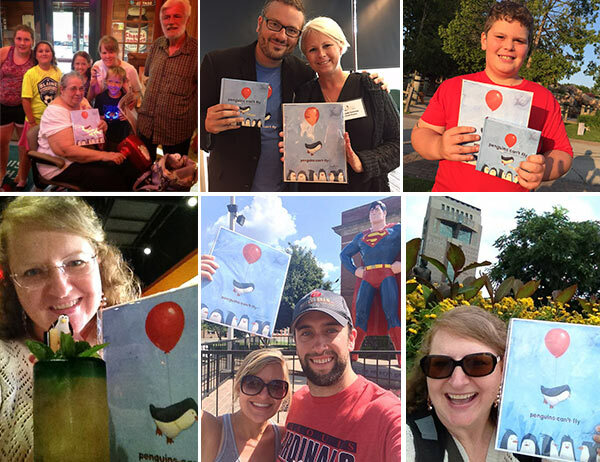 The photos above are some of our favorites, with locations like Green Bay, Louisville, Duluth, McDonald’s Hamburger University and even Metropolis (the hometown of Superman!) represented. I will send you a signed and numbered print to hide in a public place somewhere in your neck of the woods. Once you’ve hidden it, send me a “clue” photo that gives people an idea of where to look. We’ll post your clue and if someone finds the print and shares a photo of themselves with it online, we’ll send that person a free signed copy of the book! This is an exercise in tinkering, so we’ll partner with the first 12 entries and see how it goes. Wanna participate? Email me! I have been debating on where the “Perfect Place” to hide Marty would be and I have to ask . . . we have a college book store in town and I went in when the book was released to see if they carried it and they did not. “But could order it” – would it be OK to hide it in a book store? or how about Library? Escape Adulthood is the cure for the common life. It's not about escaping reality or responsibility. It's about breaking free from the vile clutches of Adultitis and rediscovering the secrets of childhood that can lead to a life filled with passion, wonder, and joy. Isn't it time to add a little happy to your inbox? We respect your privacy. We will never share, rent, or sell your information, and you can always unsubscribe from our mailings at any time by using the easy link at the bottom of every email.